This week on The Bugcast, we talk about writing, winning, gaming, and we play our usual great selection of independent music from Kelly Allyn, Sweet Play, Welcome To Ashley, Professor Kliq, White Owl, Jody Quine, My Bubba & Mi and Jonus Preston. 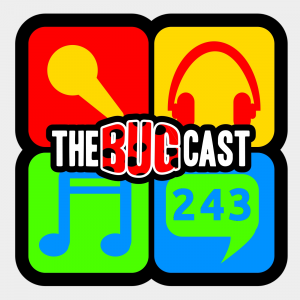 the bugcast 281 – Competition time again! This week, we announce our intention to go for the Podcast Award, and we play our usual mix of great independent music CTA, Plug & Play, Professor Kliq, Lewis On-air, Josh Woodward, MC Norman, Chaser Eight & Dust Trial. As we survived the expiration of the Mayan calendar, we thought we’d bring you a show contributed by 8 of our awesome listeners bringing you 8 awesome tracks from Aviator Shades, Persist, Vladimir Sterzer, The Acousticals, Professor Kliq, Interria, Two Crown King and The Happy Problem. A Listener’s Choice special, celebrating our 200th show, and 4th year of podcasting! Music this week from Chris Juergensen, Professor Kliq, Duwende, Lejo Harmeson & Essence, Diablo Swing Orchestra, Ghost K, Smokin’ Mirrors, Kendra Springer, Esoteric , Gender, Revolution Void, Alexx Calise, Oneside and Anyone’s Guess. Burns Night, Coffee Day, and some great (and some “different”) tracks from Professor Kliq, Tanya T6, Hungry Lucy, Dirty Old Spice, Adeline, Emerald Park, Captain Zig and Plugs.